"Yakima River, Washington - Great Rivers - Angler's OnLine"
During the summer months the Yakima River begins it's journey as a rolling, tumbling torrent, not like most mountain streams which begin as a collection of snow melt trickles uniting as small rivulets and streams merging to form larger streams, collecting with yet other to eventually form a river in a romantic kind of way. Near Snoqualmie Pass at an elevation of nearly 3,000 feet, the Yakima shoots through pipes beneath Keechelus Dam right in the heart of the Cascade Mountains and immeidately becomes a river. Of course the river is joined along the way by numberous mountain streams and continually gains flow. Some streams are significant in their own right. Rivers like the Cle Elum and Teanaway, which drain a large part of this mountainous area, empty into the Yakima as it makes its way to the valleys below. By the time the river reaches Kittatas Valley it has traveled roughly 50 miles and has been joined by numerious smaller streams. But the Yakima is not wild and out of control and seldom is even during spring sprink runoff because it's major source (snowmelt) is carefully controlled by reservoirs and dams. During summer months the Kittatas Valley appears from a distance as an oasis, a Shangri-la of green surrounded by the tawny summer grasses of this arid land. All thanks to the river. The fertile valley is renowned for it's alfalfa hay crop and beef cattle industry. When the Yakima leaves the Kittitas Valley it flows through a picturesque canyone, winding snake-like through sale and grass covered hills and eventually to the city of Yakima, some 30 miles distant. It is joined by a few small streams along this section, but none significantly add to the flow. What is significant about this section is the trout fishery. Many feel it is the best the river has to offer. Just before the river reaches Yakima it breaks out of the canyon and is joined by the Naches River, another major tributary. From that junction on as the river makes it's way through the lower valley it takes on a completely different look. The river widens and slows, nourishing orchards, vineyards and vast expanses of produce throughout the lower valley. 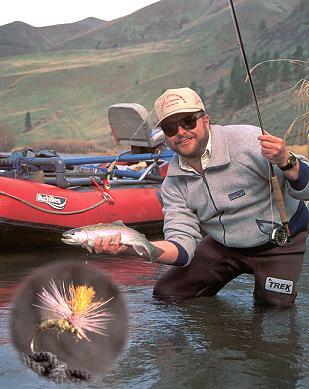 By this point in the Yakima's journey it has warmed to where trout no longer flourish and all resemblances to a trout stream have disappeared. The Yakimas is eventually joined by several more creeks and canals in the lower valley and the pace continually slows to it's confluence with the Columbia River at the city of Richland. The total distance the river covers from start to finish is about 215 miles, with roughly 75 miles being prime trout water. Just a couple of miles downstream [from the dam] the river passes by Crystal Springs campground operated by the U.S. Forest Service. During high water months of summer the river is a torrent here, an unmerciful flow created for distant farmlands. With banks brimming it rushes through log jams and sweepers and it's a very dangerious section of river. This area receives little angling attention during the high flow period for obvious reasons. By mid-September when the irrigation flows of the Yakima have ended this upper section takes on a whole new look . . .Fishing the upper reaches of the Yakima this time of year is similar to many mountain streams. 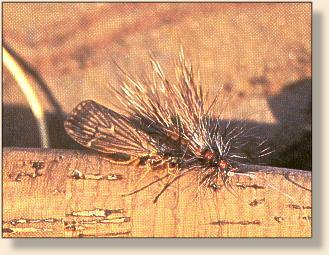 Trout tend to be on the smallish size but often come easily to any dry fly passed their way. Most trout are rainbows but the occasional cutthroat or brook trout will be landed also. 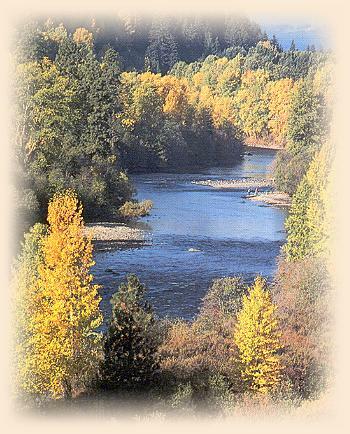 Fishing the river in the Cle Elum area is very popular. Wading fishermen have no problem finding a spot on the water and although the gentle flows of fall make for easier wading, this area is also good for the boatless angler during the higher flows of summer. There is a dike road with public access on the south side of town and good river access to the east of town. Highway 10 was the main road between Ellensburg and Seattle before Interstate 90 was built. At a point not too far from the Teanaway, the Yakima enters a canyon and winds through the hills for several miles. 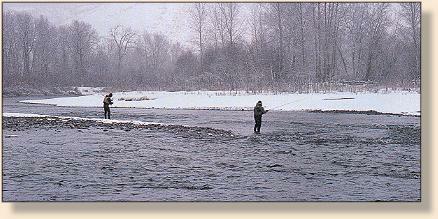 Highway 10 parallels the river throughout and offers plenty of access to bank and wading fishermen. Brook trout are rare in the Yakima now but electrofishing has shown there to be a few small ones still around. The majority of the fish in the Cle Elum to Ellensburg section are rainbows, with the odd brookie, cutthroat or bull trout sometimes hooked. From the KOA Campground downstream to the Lower River Bridge floaters should be aware of narrow channels and sweepers. For this reason, most fishermen take-out at the KOA. This area doesn't get a lot of pressure; most anglers head to the more popular and floatable stretches of the river. There are side channels and deep slots and pools that deserve attention here, the serious fly fisherman can do quite well. It is a good spot to fish if you are limited in time. 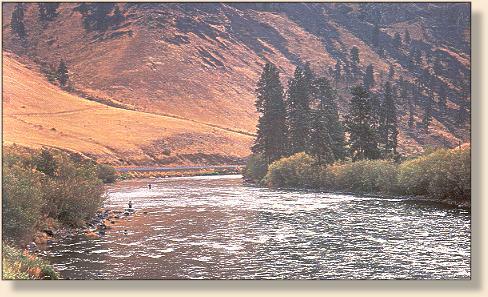 Many fishermen feel that the section of river that flows through the Yakima Canyon is best. For roughly 20 miles the Yakima winds through the arid canyon, paralleled the entire distance by Highway 821. Access for bank and wading anglers is good and the entire section is a float fisherman's paradise. Nearly every foot of the river screams TROUT! 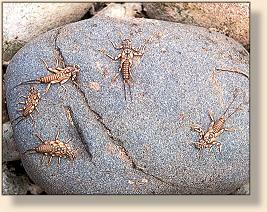 The Yakima River Canyon is, in simple terms, dry fly heaven. Dependable hatches can be found eight months of the year, starting in March and continuing through October. 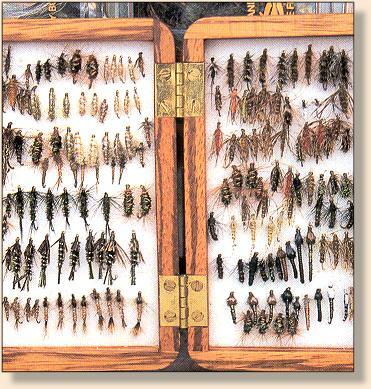 Even during winter months trout frequently rise to midges each afternoon and the patient angler can ty his luck during the brief htches of these tiny insects, providing the river isn't frozen over, but that only happens for brief periods during particular hard winters. 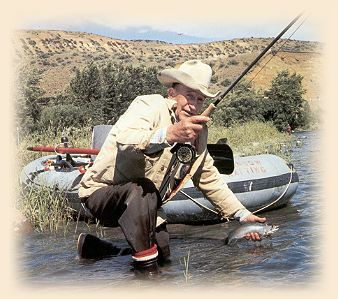 During the course of an average day of floating through the canyon a good angler can expect to catch fish ranging from 10 to 18 inches and depending on skill, the possibilities of a fish 20 inches or better certainly exist. Just before Roza Dam, heading south on highway 821, the highway climbs sharply up a hill with a hairpin turn at the top. There is a frightening cliff on the right that drops dow to the river in the deep gorge below. Immediately below the dam, the river rounds it's first turn and quiets into a large pool below the cliffs. Access is from a trail that leaves the parking area at the top of the hill. It is a steep walk down to the river. Without a boat you are very limited in the amount of fishable water in this stretch of river. In fact you can't even cover the first pool effectively. You can walk the old railroad grade that runs along the river but even then you will end up walking quite a distance to fish water that gets pounded mostly by bait fishermen. The selective fishery regulations are not in effect below Roza Dam. For a MAP of the Yakima River, click here. 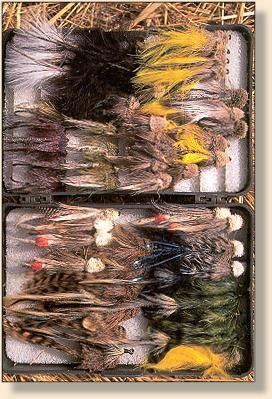 For the FLIES for the Yakima River click here. 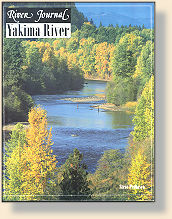 To ORDER Yakima River direct from the publisher, click HERE. Credits: From the Yakima River, part of the River Journal series, published by Frank Amato Publications. We greatly appreciate use permission.